Sclerotherapy is a medical procedure used to eliminate varicose veins and “spider veins.” Sclerotherapy involves an injection of a solution (such as sodium chloride, a salt solution, or sotradecol, a detergent) directly into the vein. The solution irritates the lining of the blood vessel, causing it to swell and stick together, and the blood to clot. Over time, the vessel turns into scar tissue that fades from view. Sclerotherapy is a well-proven procedure and has been in use since the 1930s. How will I know if I am a candidate for sclerotherapy? Prior to the procedure, you will have an initial consultation with a dermatologist or vascular medicine specialist who will advise you on your eligibility for sclerotherapy. You are not eligible if you are pregnant or are bedridden. If you have had a blood clot in the past, your eligibility will be decided on an individual basis, and will depend on the overall health of the area needing treated as well as the reason for the clot. Veins that are potentially usable for future surgical bypass procedures (i.e., use of the saphenous vein, a large vein in the leg used for coronary artery bypass graft surgery) will generally not be considered for sclerotherapy. In most cases, the sclerosing solution is injected through a very fine needle directly into the vein. At this point, you may experience mild discomfort and cramping for 1 to 2 minutes, especially when larger veins are injected. The procedure itself takes approximately 15 to 30 minutes. You should plan to wear shorts during the injection. The number of veins injected in one session varies, and depends on the size and location of the veins, as well as the general medical condition of the patient. Sclerotherapy is performed in the doctor’s office by a dermatologist or vascular medicine specialist and requires that you do not partake in any aerobic activity for two days after the procedure. What you need to do before the procedure? Prior to vein injection, you should avoid certain medications. Tetracycline, an antibiotic, may possibly cause a staining of the skin if taken seven to 10 days before or after sclerotherapy. If you need to take an antibiotic before sclerotherapy, contact your physician. No lotion should be applied to the legs before the procedure. Some physicians recommend avoiding aspirin, ibuprofen (i.e., ®Advil and ®Nuprin) or other anti-inflammatory medications for 48-72 hours before sclerotherapy to minimize bruising. Tylenol, however, should not affect this procedure. Could sclerotherapy cause any side effects? You may experience certain side effects after sclerotherapy. There are milder effects, such as itching, which can last for one or two days after the procedure. Also, you may experience raised, red areas at the injection site. These should disappear within a few days. Bruising may also occur around the injection side and can last several days or weeks. 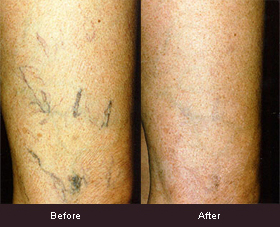 Larger veins that have been injected may become lumpy and hard and may require several months to dissolve and fade. Transient hyperpigmentation consists of brown lines or spots may appear at the treatment vein sites. In most cases, they disappear within three to 12 months, but some pigmentation may take up to two years to fade. Neovascularization describes a temporary development of new, tiny blood vessels, also known as “flares,” “mats,” or “blushing.” These tiny veins can appear days or weeks after the procedure, but should fade within 3-12 months without further treatment. If mats persist, they may be treated with vascular lasers. Allergic reactions to the sclerosing agents may occur at the time of the injection and are rarely serious. If you have a history of allergies, you have a greater chance of experiencing an allergic reaction to the agents. A minor allergic reaction will cause itching and swelling. To avoid any serious complications, your doctor will test the agents on a small area before applying the solutions to a larger area if there is concern over a possible allergy to the agent. If you have any concerns or questions following this procedure, you should contact your doctor. After the treatment you will be able to drive yourself home and resume your regular daily activities. Walking is encouraged. You will be instructed to wear medical grade support hosiery to “compress” the treated vessels. If you have compression hosiery from previous treatments, you are encouraged to bring them with you to be certain they still have adequate compression. Department store support stockings will not be adequate. Your doctor’s office can recommend where to purchase heavy compression stockings. Following the injections, avoid aspirin, ibuprofen or other anti-inflammatory medications for at least 48 hours. Tylenol may be used if needed. Showers are permitted, but the water should be lukewarm. The injection sites may be washed with a mild soap and tepid water. Studies have shown that as many as 50 percent to 80 percent of injected veins may be eliminated following a series of sclerotherapy sessions. Less than 10 percent of the people who have sclerotherapy do not respond to the injections at all. In these instances, different solutions can be tried. Although this procedure works for most patients, there are no guarantees for success. In general, spider veins respond in three to six weeks, and larger veins respond in three to four months. If the veins respond to the treatment, they will not reappear. However, new veins may appear at the same rate as before. If needed, you may return for injections. Will my insurance cover sclerotherapy? Most insurances consider this procedure cosmetic and therefore do not cover the procedure. Please make an appointment to see one of our expert sclerotherapy injectors at Skin Care Doctors, P.A. to discuss cost and if this treatment is right for you.